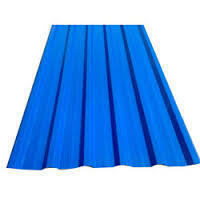 Our organization has a very modern and sprawling infrastructure which has all the latest and sophisticated facilities to manufacture beat-in-class Metal Roofing Sheet . Well known for its striking features, this Metal Roofing Sheet is broadly used for roofing purposes in commercial and residential buildings. Incepted in 2012, in Ghaziabad (Uttar Pradesh, India), we “S.R. Steel” are engaged in Manufacturing and Supplying a wide range of Air Ventilator, Metal Decking Sheet, Pre Engineered Buildings, Color Coated Profile Sheets, Z And C Purlin, Poly Carbonate Sheets, FRP Sheets, Bare Galvalume Sheets and Coils, CRCA Sheets and Coils, HR Sheets and Coils The offered products are manufactured using cutting-edge technology and superior quality raw material in accordance with the international quality standards. We offer this range in several specifications in order to meet the variegated demands of the clients. Appreciated for easy to install, lightweight, optimum strength, corrosion resistance, durability and dimensional accuracy, these products are broadly recognized in the industry. In order to ensure on-time delivery, we have arranged a wide distribution network. Our customer centric policies, ethical business policies and reasonable price have garnered huge client base all across the globe.